NAMM 2019: EVH has unveiled its new Striped Series Shark Model. 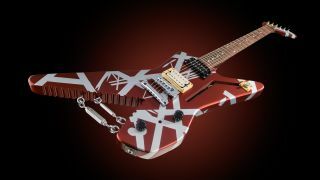 The model is based on the iconic striped guitar that Eddie Van Halen debuted during the first Van Halen world tour in 1978. Eddie Van Halen first took his angular offset axe and sawed a chunk out of the body, leaving jagged edges in the wood that resembled teeth. After applying a coat of silver paint, Van Halen added tape to create his famed striped pattern and then grabbed a rattle can of burgundy Schwinn bicycle paint to finish the job. The final product notably appeared on the back cover of Van Halen's 1980 album, Women and Children First.